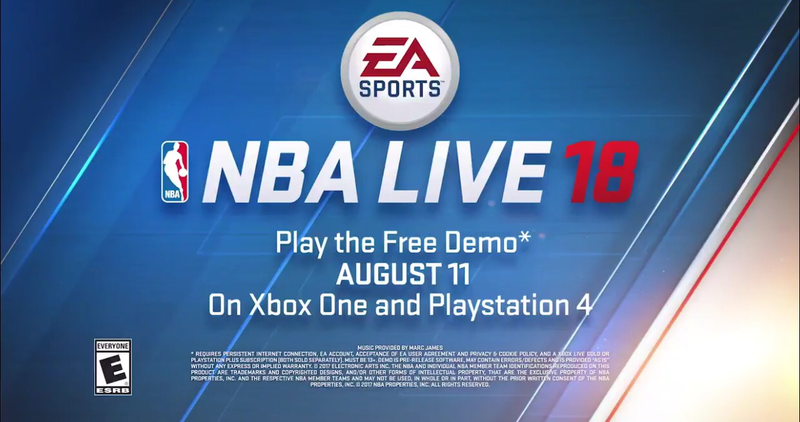 The NBA Live 18 demo is scheduled to be released on Friday, August 11 for both Xbox One and PlayStation 4. We know it’s a demo of The One, but it could feature a few other things. Once we get more details, we will update this post. Nice! I will be looking forward to this. Glad to have that out there official at least. After that accidental tweet couple weeks back August 11 was pretty much a given.. I was really hoping for a PC release. Oh well. Still excited to try it out. Perfect time to release it. 2K gamers are tired of '17, so they'll come check it out. Gives us enough time to play it and see if we like it or not before games such as Madden come out. Just hoping that they give us the ability to play online in this demo like in the '16 demo. Awesome timing! With M18 set to drop on the 22nd gives us time to really test it out. Hoping to see vast improvements from 16, which from the gameplay videos we seen it has. I will be at my future in-laws from the 10th to 13th. couples vacation with friends that weekend BUT its on when i return Sunday. This is great and but you'd think they'd announce an official release date too, alongside of the demo release date. Is it common to get demos on Friday? And when are we getting the scan app? You'll get a feel for NBA as well. Nice can't wait to give this game a try and see it in motion on a TV. A little disappointed there was a gameplay trailer to accompany this announcement but I'm sure we will be getting plenty of information and gameplay soon enough. Phew! It's nice to have an official date. I hope they don't wait 10 days prior to the full game release to tell us the date for that. @WTF -- can you tell us whether the demo will only feature Drew League & street parks, or will it also have actual NBA teams we can play with? Hellblade and NBA Live 18 DEMO next week? I am more excited for this demo than any bball game in a couple of years. Though I will say that 2kU demo last year was hot and sucked me into that game until they switched the game up with updates and completely changed the feel back to the stale animation controlled gameplay. So maybe I should learn to temper my excitement for any game lol. Sounds like it will be similar to the 16 demo...nice...we'll see what they got going on! I just want to play 5 vs 5 game. If they have the warriors vs cavs, or other real teams to just sample game play is what im interested in. I hope its not just the one stuff. Friday? I look forward on trying it out. Well this is mostly a super serious sim community, but I'm one of the few that mainly plays the career modes. Will we be able do face scans, get a head start on our character etc? A YouTube interview I posted a month or so ago said the app would release before the demo . Haven't heard anything since though . Isn't this about the time they released a demo in their last run? I hope this game is good but I'm worried they are releasing this 4 months ahead of the games release to gauge interest. I pray they didn't put LaVar Ball in the game. Four months? The game comes out in a month and a half. When? Everytime that I Google it the only response says December 2017. Edit:. I just tried to look it up on Best Buy and GameStop. It is not on either of their websites. Besides The One mode I wonder what teams will be available to play in the demo? Golden State, Cavs, Rockets, & Celtics are my guess. The December date you are seeing is a placeholder date. Happens with all games that don't have an official release date. WTF said it was coming out 9/15. No way they release this in December. Considering the release date of the "other" NBA game, I can't decide if that release date is a genius move, or a terrible move. I'll definitely be testing out this demo though. Have to see how far this game has come. Word. I'm hoping I actually like this Live. The 16 demo, while the graphics were good, I couldn't eff with the gameplay and the demo was deleted after 2 or 3 go rounds. I'm not an "onliner" so I didn't care for Pro-AM. Agree with the 16 demo. Worst gameplay I've seen from a next gen hoops game tbh. Looking forward to starting 'The One'. Really like playing w/ friends in Live 16 with summer circuit and LIVE RUN so I am excited about this. I believe you, but on EA's end why the heck will they not let you pre-order it yet? Especially since it is only a month and a half away. This is awesome, hard to argue with a demo coming out a month or more before the game's release. Really hoping I'm as into Live this year as those who have played it seem to be. I'm not dogging 2k, just been there and done that a lot lately, found the game a bit stale last year to say the least.? Let's do this EA, don't eff it up! legendary gold elite platinum epic collector season-pass editions of games are $150 now. i'd rather just get two standard games for $120. I am wondering if they have not given an official release and a put up preorders because they are contemplating doing what 2k once did as the underdog and selling the game at a significant discount. First 2k I ever played was because I could pick it up for 20 bucks. I believe that 2K's confidence in that game going forward once they could get it into households was the genesis to their market dominance today. @WTF -- will the demo be an "unlimited" demo (playable forever like the Live 16 demo), or like an EA Access type of thing? I never got around to buying Live 16 at the time, only downloaded the demo. A month ago I began playing the demo in anticipation of Live 18, and I went out and bought 16 for $9.99 -- I've been playing it nonstop ever since. Believe it'll be unlimited demo with ability to carry over progress. Will it release at midnight? Nice I look forward to playing it....I'm playing Live 16 and I'm loving how controllable your guy is. Nothing has been confirmed on what is actually available in the demo. More than likely the option to play Cavs v Warriors will be there among other things. I could've sworn that wtf already said that you can play as NBA teams. I'm also pretty sure that the wnba are also playable. The Live 16 demo had 6 NBA teams you could play as/against, in addition to the "my player" (Rising Star), and Pro-Am/street park modes. I gotta give EA credit, even though the Live franchise has been plagued with issues, the Live 16 was pretty heavy-featured and it's playable even to this day. I am expect this demo to be the same. Will be disappointed if the game doesnt have a PS4 pro mode. Really hoping we get a chance to play online Pro-Am like 16. I had a lot of fun grinding out the games and getting a feel for the game while unlocking stuff. I feel like that made it a very unique demo too that it would be disappointing if we were just stuck with strictly offline this time. Is this only available in New Zealand store? I'm going to wait until it's available for the US. Not exactly sure if I would have to log in/out of my US account everytime, so I'm simply going US official. I think it's available for us on xbox one or so I've heard. Yes. After you play the my career mode for 2 chapters (2 quick cpu pro am ish games) then you unlock playing online with others online, you just have to go back to the main menu for that.